Since it had been over two months since I last attended an AKB handshake event, I was really looking forward to this one. Granted, I did attend SKE and HKT events in August, but even those were over a month ago. I had eleven tickets in total, with a couple for members I have only rarely interacted with in the past. This event also had the various prize draws. I didn’t have any 2-shot selfie tickets, but I did have a few 1-shots, various signed items, and two ‘janken’ tickets. I was also surprised that most of the lanes I visited had unusually long queues. I mean sometimes it is to be expected, but there were a few surprises. Most of my ticket were between Slots 4-7, but I had to get to Makuhari in the morning since I had two tickets for Slot 2. I arrived 15 minutes into the slot, and quickly got my tickets stamped. In the meantime I ran into my friend Nory who arrived on the same train. In fact I ran into quite a few overseas fans throughout the day, and I spent most of the day hanging out with my friend David. Kobayashi Ran (Lane 70) Wow, look at the big queue! In past singles you could walk straight to the booth to visit Ran-chan. I had two tickets, but decided to do them simultaneously since I wasn’t sure if I would have time to loop the lane. I checked in still expecting that I would win the prize, but I lost both times. Ran-chan had the flag from her Janken Unit ‘Hinaran’ taped to the wall in the booth. I told her that I hadn’t seen her lately because I kept getting bad cancel machi numbers, to which she responded by asking my name and confirming that I live in Japan. I realized I had never told her any of that before. We’ll see if she remembers my name the next time I see her. I will be pleasantly surprised if she does. Since I had no tickets for Slot 3 I went back toward the train station for lunch. When I returned I decided to sign a few birthday cards, and one graduation card. Ultimately I signed birthday cards for Maichan, Ranchan, and Katsumata Saori. 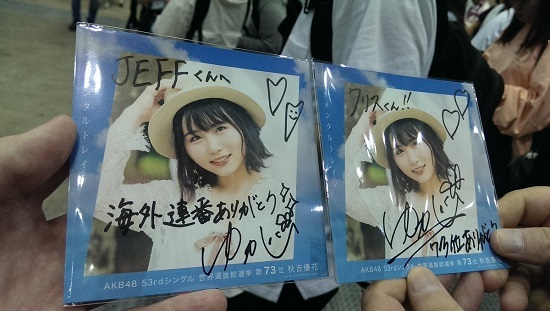 There was also a Kaotan graduation card table, so I signed a card there too. Yamane Suzuha (Lane 69) In the meantime Zunchan’s queue had grown quite long. But it was my only other ticket for Slot 4. Per usual, she had her “bio” sign taped to the front of the lane. Inside she had a few decorations, and a big sign talking about the new single, and her participation in the Showroom senbatsu. I also noticed her hair was a bit different, so I asked her if she had darkened her hair. She was like “Huh?” “Your hair, isn’t it darker?” “Uhhh, yeah!” So I told her it was cute, and she thanked me. Another thing I noticed throughout the day was that many of the guards were calling supervisors for assistance. I’m sure they do it all the time, but it was very noticeable since I guess they were instructed to raise their hands if they needed an issue addressed. I know in one particular case a guy who won the 2-shot selfie was insisting that a guard take the photo, ala the 2-shot album events. I also heard that someone in the Yabuki Nako thread got angry when they lost the draw for the prize, so security needed to intervene. We were waiting in the queue, and one of the supervisors came over and informed us we were moving to another lane, which was odd since this was Komiharu’s lane, and there was no issue from the previous slot. 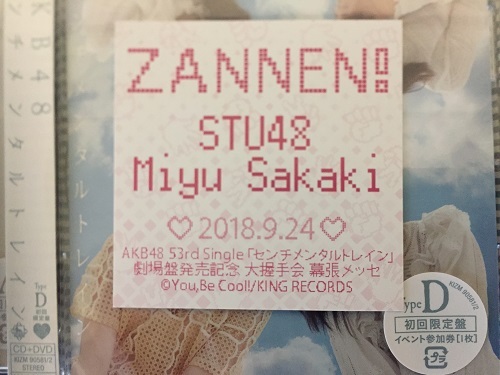 So they moved us to Lane 69 (where I had just seen Zunchan) We stood there for 10 minutes while a series of guards came over looking thoroughly confused. Eventually they announced that they had made a mistake and were taking us back to the original lane. However, in the interim another queue had formed in that lane. They put us at the end of the queue, and people immediately started complaining. After all, we were originally in front of the line. So they took the new queue out of the lane, put us in front, and put hem behind us, which annoyed and confused those people. Ugghh. So I had decided on the fashion show, which with the benefit of hindsight wasn’t the best choice. Not that it isn’t a cute video, she looks really good. But since I had never really spoken to her before I should’ve had her talk instead. Actually, I would have just assumed not win this particular prize and instead spend my time talking to her. However, they did give me enough time to mention that I had met her during ‘high touch’ a couple of times in the past, and that I really wanted to meet and talk to her. So all good. BTW, I know she supposedly can speak decent English, but she stuck with Japanese for our visit. Yamauchi Mizuki (Lane 87) As expected, her queue was quite long, and again I lost the draw. While I was waiting in queue the MV for the 80-100 ranked member song came on, which is probably my favorite song of the single. When it was my turn, I lamented that ‘Macarons,’ her janken unit, was eliminated too quickly. She gave me a sheepish look. Then I told her how much I liked the “Nami ga” song. Zukki is always a pleasure to visit. In between slots I decided to pick up a couple versions of the new single. I went with A and D (forgoing Yukachan’s unit on version C) Plus, the CDs came with shop bonuses and random ‘event exclusive’ bonus pics. 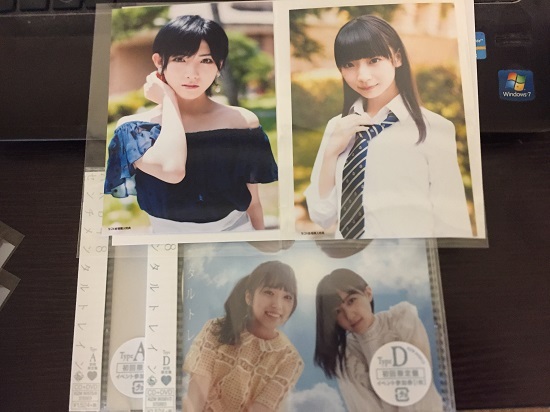 The photos were of Dasu, Sakura, Yui, and the two I got, Naachan and Ogino. Eventually I will need to get a C version or I will never be able to look Yukachan in the face again! Sakaki Miyu [Cuca] (Lane 61) The lane was delayed because Imamura Mitsuki went overtime, but they eventually moved her remaining queue to another lane. Cuca’s queue was short in the beginning of the slot, but grew huge toward the end, and she wasn’t starred for oshi-mashi either. Quite a surprise. In this slot you played Janken with the member for a signed card. I tied (we both threw choki) so I ended up with an unsigned ticket. But I had time to mention that I was rooting for Butai de Tai during the janken, and they came close to winning their group. Murakawa Bibian (Lane 49) My friend David and I planned on going tandem for this lane, so I waited for him to show up before we queued together. Bibian’s line was huge, and moving at a snail’s pace, although we didn’t realize why until we got closer to the front. Bibian’s queue has been long for the last couple of singles, so I think it’s time to begin giving her multiple slots again. One just isn’t enough. While we were waiting we had a clear view into Tashima Meru’s lane, and a fairly decent view into Madoka’s lane. It was fun watching Meru, as she is very playful with her fans. This was David’s first time meeting Bibian, and he was taken with how goofy and fun she seemed to be with all the fans. As we got closer to the front of the queue we noticed pretty much everyone seemed to be winning the signed Janken card with Bibian. So I decided to watch her, and quickly noticed that she was throwing ‘rock’ over and over. Well okay, if she is going to make it THAT easy. I went in, threw ‘paper’ and won. 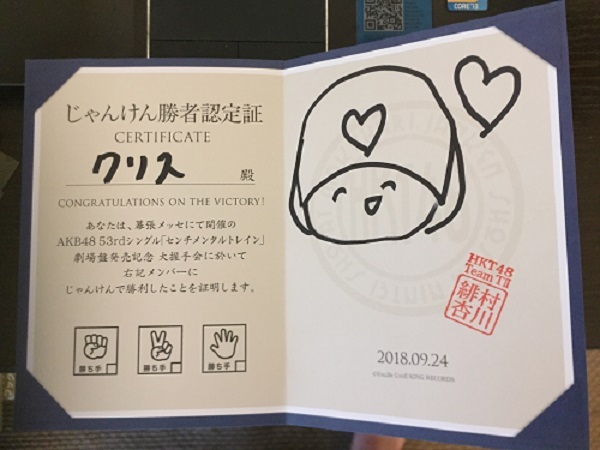 (David did the same) There were three different versions of the prize you could choose if you won, and I selected the one that looked kinda like a diploma. While she was signing Bibian admitted to me that she has been practicing English with the aid of an iPhone app. She was timid about it, but she was actually telling me this with fairly decent English. I mentioned that I take Japanese classes, and it is very hard, especially the kanji. She acted completely surprised that I took kanji classes, and mentioned her name has difficult kanji. I countered that her family name isn’t difficult at all. Matsumura Kaori (Lane 23) After the dinner break, I decided to queue early for Kaotan. However before I could I had to wait for 1) Obamina to come out and make a ‘thank you’ speech to her fans for voting her into senbatsu. I had a pretty good vantage point for that, and 2) the Furuhata Nao fans to finish waving goodbye to her. Once they were done we were allowed to queue. While we were waiting, a few of the members passed by the lane, including Tani, who I had to hide from since I didn’t have any tickets for her today. Eventually Kaotan came out. She had the staff reconfigure her booth, wiped down the counter, and grabbed a new water bottle before she was finally ready to begin. “Kaotan, Soutsugyou Kita!” I told her some of my friends were asking if I was okay after she made the announcement. But I told her I supported her decision. 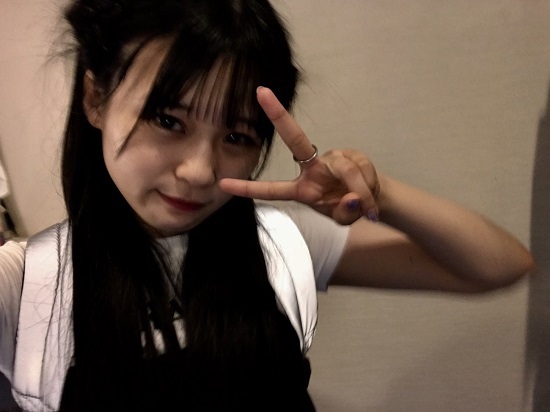 She mentioned that there will be more handshake events before she leaves (I didn’t ask her about a date) to which I informed her I would see her at the SKE event in a couple weeks. I told her that it had been too long since our last visit, and I was happy to see her again. I then informed her I would be bringing another friend when I looped the queue. In the meantime David had gone to yet another lane, and another. He was in danger of missing out on Yukachan entirely. I was messaging him “Don’t make me a liar, I already told her you are coming,” and giving him a time countdown. He finally finished visiting Kitano Ruka, and ran over to Yukachan’s lane with about a minute to spare. This time I didn’t win the jacket, which was fine, and David won, which was even better. Anyway, I told her about my upcoming trip to Sadogashima next weekend. She said it sounded like fun. So I was done. I agreed to wait for David to finish his one Slot 8 ticket with Mukaichi Mion before we left Makuhari and went to dinner. It was a long day and my feet hurt. I have tickets to two handshake events in October, one for SKE, and the other for AKB’s Teacher Teacher Single.